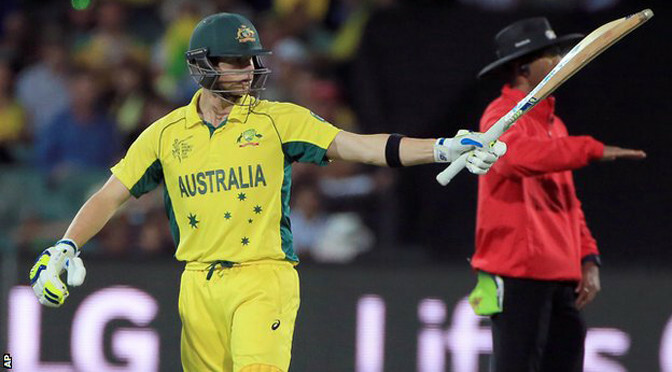 Australia powered into the World Cup final with a 95-run victory over defending champions India in Sydney. Steve Smith struck a fluent 105 from 93 balls and Aaron Finch 81 as Australia posted 328-7, the highest score in a World Cup semi-final. India made a solid start to their reply but lost four wickets for 32 runs and fell well short on 233 despite captain MS Dhoni making 65. Australia will meet fellow co-hosts New Zealand in Sunday’s final in Melbourne. They will do so looking for their fifth World Cup crown – no other team has more than two – and on the back of a seventh semi-final win in as many attempts. For India, the defence of the trophy they won on home soil four years ago and a run of 16 consecutive wins in major one-day tournaments – the World Cup and Champions Trophy – is over. They can reflect on how their top order fell apart after openers Shikhar Dhawan and Rohit Sharma put on 76 inside 13 overs, but perhaps Dhoni’s biggest mistake was calling incorrectly at the toss. As a result, India, who failed to win any of the 10 matches on their tour of Australia that preceded the World Cup, were made to bowl first on a Sydney pitch that was full of runs. Even then, Australia failed to fully capitalise on the second-wicket stand of 182 between Smith and Finch, as Michael Clarke’s men were stunted by the off-breaks of Ravichandran Ashwin and a curious collective failure against back-of-a-length bowling. Australia raced to a seven-wicket win and condemned Scotland to a sixth straight defeat in the final World Cup Pool A game. Mitchell Starc took 4-13 and Pat Cummins 3-42 to bowl Scotland out for 130 in 25.4 overs in Hobart. Michael Clarke, promoted up the order, hit 47 as Australia won with 34.4 overs to spare after a 90-minute rain delay. They face a quarter-final against Pakistan or Ireland, who meet on Sunday, in Adelaide on 20 March. 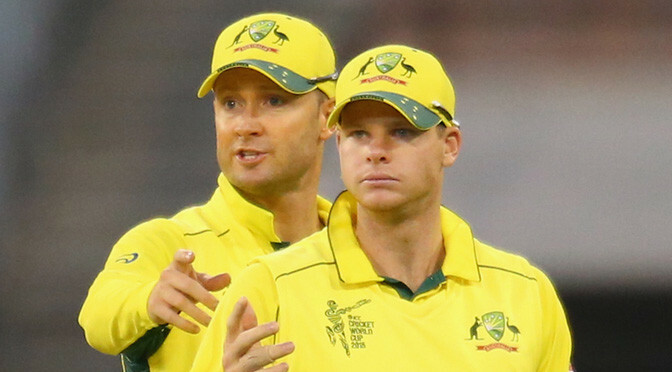 Australia captain Clarke said: “We had one little hiccup against New Zealand, but now it’s the knockout stages. Scotland finished bottom of the group, having extended their unwanted record of World Cup games without a win to 14 since their debut in 1999. The batting problems which have undermined this campaign – Scotland have been bowled out in all but one game – were evident again as five players made ducks. Glenn Maxwell hit the second-fastest century in World Cup history as Australia beat Sri Lanka by 64 runs to advance to the quarter-finals. 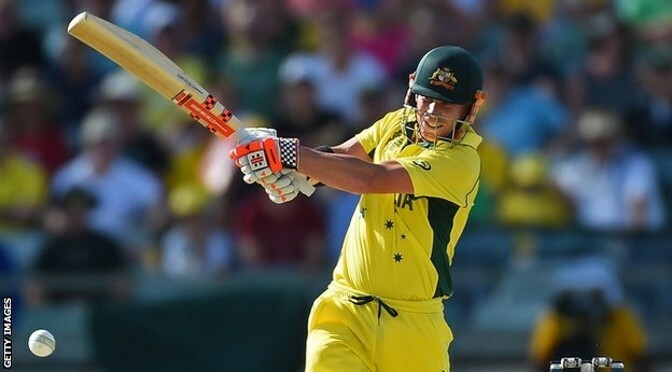 Maxwell’s first one-day international ton, reached off 51 balls, inspired Australia’s total of 376-9 in Sydney. Sri Lanka fell short in a spirited run chase despite a third consecutive World Cup century from Kumar Sangakkara and a quickfire 52 from Dinesh Chandimal. Australia are likely to meet either Ireland or Pakistan in the last eight. Michael Clarke’s side, who face Scotland in their final Pool A match in Hobart on 14 March, should finish second behind New Zealand in their group, and would therefore meet the team that finishes third in Pool B.
Sri Lanka, who lie in third place in the group with six points from their five matches, also face Scotland in their final Pool A match in Hobart on 11 March. Maxwell hit 10 fours and four sixes in an innings of 102 that combined deft placement with power hitting, as the 26-year-old finally reached three figures in his 45th ODI. He was denied a share of the fastest World Cup century arguably only by his own honesty, after he answered in the negative when asked by umpire Ian Gould whether he had got a touch on a legside glance off Lasith Malinga in the 45th over. Maxwell bought up his hundred in the next over, off 51 deliveries, one more than it took Ireland batsman Kevin O’Brien to decimate the England attack in Bangalore in 2011. However, it is the fastest ODI century by an Australian, beating James Faulkner’s 57-ball century against India in 2013. The Victorian received a bear-hug from batting partner Shane Watson, who hit 67 runs in 41 balls on his return to the side after being dropped for the previous match against Afghanistan. Australia posted a World Cup record total of 417-6 as they beat Afghanistan by 275 runs – the biggest winning margin in the tournament’s history. David Warner hit 178 off 133 balls, Steve Smith scored 95 while Glenn Maxwell struck 88 in 39 deliveries in the Pool A encounter in Perth. Afghanistan were then dismissed for 142, with Mitchell Johnson and Mitchell Starc taking six wickets between them. Australia’s score surpassed the 413-5 India made against Bermuda in 2007. It continues the pattern of bat dominating ball in this tournament as the third 400 plus score achieved in the pool stages, following South Africa’s 408-5 and 411-4 against West Indies and Ireland respectively. The winning margin beats the 257-run amount by which India beat Bermuda in Port of Spain in 2007, which was equalled five days ago by South Africa in their victory over West Indies in Sydney. Australia’s total is their second-highest score in a one-day international, after their 434-4 against South Africa in 2006. The ODI record score remains the 443-9 made by Sri Lanka against Netherlands in 2006. Afghanistan elected to bowl having won the toss, and removed opener Aaron Finch in the third over, but they were dominated thereafter. Warner played the aggressor, ably assisted by the more conservative Smith, with the pair adding 260 – a record Australian partnership for any wicket in ODIs – before the former was caught at mid-on by Mohammad Nabi off the bowling of Shapoor Zadran in the 38th over, just seven runs short of Shane Watson’s record Australian ODI score of 185. If Afghanistan thought this would bring them some respite they were wrong as Maxwell took over, hitting six fours and seven sixes in a brutal 39-ball innings, during which he scored 88, as Smith increased his own scoring rate to reach 95 before driving one straight to Najibullah Zadran off Shapoor with seven overs remaining. Despite the fall of three further wickets, returning captain Michael Clarke did not come out to bat, allowing James Faulkner (7), Mitchell Marsh (8) and Brad Haddin (20 not out) to help Australia to their record total. As expected, Afghanistan were unable to cope with the Australian bowling attack, with their top order removed before they could reach three figures. Johnson played a major role, having Usman Ghani, Nawroz Mangal, Asghar Stanikzai and Hamid Hassan all caught and Josh Hazlewood picked up two wickets, while Clarke unexpectedly got in on the act with a five-over spell of off-spin, during which he had Samiullah Shenwari caught by Johnson at short fine leg. Starc – who almost salvaged a win against New Zealand in a dramatic encounter in Auckland four days ago – came to the fore later in the innings with two wickets to help seal the record win. New Zealand survived a late collapse to beat Australia by one wicket in a thrilling World Cup Pool A game. Chasing a meagre 152 to win, the Kiwis slipped from 131-4 to 146-9 as Mitchell Starc claimed 6-28. However, Kane Williamson (45no) hit Pat Cummins for six to seal victory with 26.5 overs to spare in a wonderfully tense climax at Eden Park in Auckland. Earlier, Australia lost eight wickets for 26 runs as they were bowled out for 151, with Trent Boult claiming 5-27. “I was always going to try and hit a boundary at the end as I didn’t want to leave it too long,” Williamson told Test Match Special. New Zealand, who have won all four of their group matches, need only one victory from their remaining two games – against Afghanistan and Bangladesh – to secure their place in the quarter-finals. Tournament favourites Australia, meanwhile, have three points from their first three games, heading into Wednesday’s clash with Afghanistan in Perth. This was only the sixth one-wicket win in World Cup history, although such a slender margin of victory appeared unlikely in the extreme as Brendon McCullum flayed a 21-ball fifty to lead the Kiwi pursuit. Even after he fell in the eighth over to spark a collapse of three wickets in five balls – Ross Taylor and Grant Elliott were bowled by Starc either side of the interval – few doubted the outcome. Williamson and Corey Anderson took New Zealand to within 21 runs of victory before Glenn Maxwell induced an ugly swipe from the left-hander that found only mid-on. Starc, combining fast, full deliveries with well-directed bouncers, had an evasive Luke Ronchi caught behind off his glove, then Cummins accounted for a needlessly reckless Daniel Vettori. New Zealand nerves were evident as Starc cleaned up Adam Milne and Tim Southee with successive deliveries, but Boult kept out the last two balls of the over and Williamson drove the first ball of the next over long-on to cap a remarkable game. “My heart was racing at a million miles an hour when I went out there to bat. I’ve never been so nervous in my career,” Boult told Test Match Special. Even Starc’s career-best return could not mask an inept Australia batting display that featured a precipitous collapse from 80-1 to 106-9. While fellow left-arm Boult was the chief beneficiary en route to his best ODI figures, Vettori’s impact was crucial. Introduced only six overs into an innings which began with a barrage of boundaries, the veteran left-arm spinner accounted for Shane Watson and Steve Smith either side of Tim Southee’s removal of David Warner for 34. Vettori finished with 2-41, while Boult claimed five wickets for one run in 17 balls in front of a boisterous home crowd en route to his best ODI figures. Even Brad Haddin’s pugnacious 43 in a last-wicket stand of 45 with Cummins – an Australia World Cup record – could not prevent Australia posting their lowest World Cup total batting first. England were outclassed by an impressive Australia in a 111-run defeat on the opening day of the World Cup in Melbourne. Aaron Finch, dropped on nought by Chris Woakes in the first over, hammered 135 and Glenn Maxwell a 40-ball 66 to propel the co-hosts to 342-9. Chasing the biggest score they had ever conceded in a one-day international against Australia never seemed likely for England and a top-order collapse further demonstrated the gulf in class. Mitchell Marsh took 5-33 as England were bowled out for 231 despite an inventive unbeaten 98 from James Taylor. Although an expected defeat by the tournament favourites does little damage to England’s hopes of reaching the quarter-finals, the manner of the reverse should provide cause for concern. They were substandard in the field, lacked control at the end of the Australia innings and were saved from their heaviest World Cup defeat by Taylor. The most costly mistake was made by Woakes, dropping a simple chance above his head at square leg off James Anderson to reprieve Finch from only the fifth delivery. The right-hander made the most of his let-off to dominate the innings through flicks off his pads, brutal pulls and powerful hits down the ground. But the biggest disappointment was England’s death overs, which featured too few yorkers, too many slow bouncers and Maxwell’s clean striking. Steven Finn at least claimed the first World Cup hat-trick by an England bowler from the final three balls of the innings, all skied catches. Bowling first on a flat pitch in the hope the overnight rain would result in some assistance, England reduced Australia to 70-3 by Stuart Broad and Woakes finding movement on a good length. The lesson was not learnt, though, and George Bailey was allowed to settle on a diet of short bowling, making 55 and rebuilding in a stand of 146 with Finch. When Finch and Bailey fell, England looked like they might check Australia’s progress, but Maxwell provided the late carnage. The final 10 overs yielded 105 runs, including 76 off the last six. A successful chase looked fanciful, but England’s tepid reply never had them in the game. As Australia hit their lengths and held their catches to provide the visitors with a lesson, one by one, England’s batsmen holed out. Moeen Ali started the rot by pulling Mitchell Starc to mid-on, before Marsh’s medium-pacers took over. Gary Ballance – in the side for Ravi Bopara – flicked to short mid-wicket, Ian Bell cut to deep point, Joe Root top-edged and captain Eoin Morgan toe-ended a pull to diving wicketkeeper Brad Haddin for a third successive duck against Australia. Steve Smith’s wonderful flying catch at short cover accounted for Jos Buttler and left England at a hopeless 92-6. However, Taylor, dropped down the order to accommodate Ballance, did find a way to score by running hard and capitalising on what loose bowling was on offer. He nudged towards a maiden century in the company of last man Anderson, but was given out lbw to Josh Hazlewood, only for the decision to be overturned on review. But, from the same delivery, Anderson was run out and, amid confusing scenes as the TV replays were consulted, England’s fate was sealed. The International Cricket Council’s later admitted that an error had been made and that the ball should have been declared dead, but the decision was incidental to a one-sided result. On Friday they face co-hosts New Zealand, who beat Sri Lanka by 98 runs in the tournament opener in Christchurch earlier on Saturday. Michael Clarke will not be rushed back for Australia’s World Cup opener against England at the MCG on Saturday. Australia’s coach Darren Lehmann has confirmed Clarke will instead stick to the original timeline for recovery from his hamstring surgery, and is expected to return against Bangladesh on February 21. On Thursday morning, Clarke jogged and walked laps of the MCG in a light training session following Australia’s comprehensive win over the UAE, in which he top scored with 64 and bowled two overs. There could have been a temptation for Australia’s selectors to view that performance as evidence he was ready to play against England, but Lehmann said a cautious approach was best. Clarke still has some fitness tests to pass before he is cleared to return to the side, but his progress has impressed the team’s medical staff and he is not expected to be in doubt for the Bangladesh game at the Gabba. Clarke was not the only injured player jogging laps at the MCG on Thursday, with all-rounder James Faulkner also enjoying a light training run as he continues his recovery from a side strain. Faulkner has batted in the MCG nets this week but the timeline for his return is unclear. He has no chance of playing against England, and may be reserved for the second half of the tournament. Faulkner’s absence means Australia will need their other seam-bowling all-rounders, Shane Watson and Mitchell Marsh, to take on a greater bowling workload, but his finishing with the bat will also be greatly missed. Remarkably, Faulkner is currently ranked 22 on the ICC’s ODI batting rankings, and Lehmann said there was some chance he could play as a batsman only. 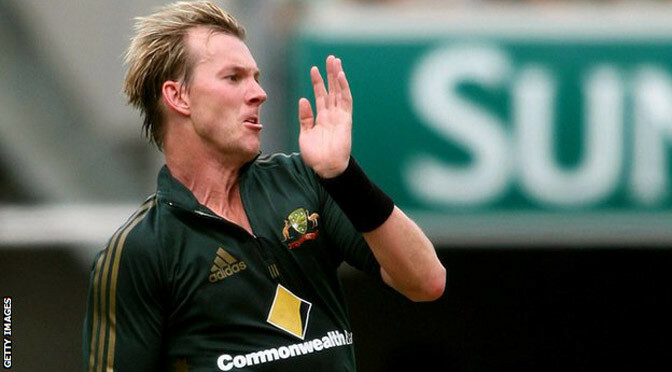 Australian fast bowler Brett Lee has announced his retirement from cricket. He quit internationals in July 2012 as his country’s fourth-highest Test wicket-taker – with 310 in 76 matches – and has focused on Twenty20 cricket in recent years. Lee, who took 380 one-day international wickets, made the announcement at the Sydney Cricket Ground on Thursday. “It’s been an amazing and emotional 20 years and I’ve enjoyed every single moment of it,” said the 38-year-old. He will see out the remainder of the Big Bash League with the Sydney Sixers – which could mean his final game coming next Thursday against Sydney Thunder. Only Shane Warne, Glenn McGrath and Dennis Lillee took more Test match wickets for Australia than Lee, who was nicknamed Bing. He remains the joint leading wicket-taker for Australia in one-day internationals alongside McGrath. “I’m excited and emotional, certainly happy that I’ve made the right decision,” Lee added. Lee was a central figure in the Australia sides that dominated world cricket in the 1990s and 2000s, and won the World Cup in 2003, as well as three of the four Ashes series he took part in. “He has been an exceptional cricketer who gained fans around the world, not only for his electrifying pace and performances with the ball, but [for] the way that he played the game,” said Cricket Australia chief executive James Sutherland.